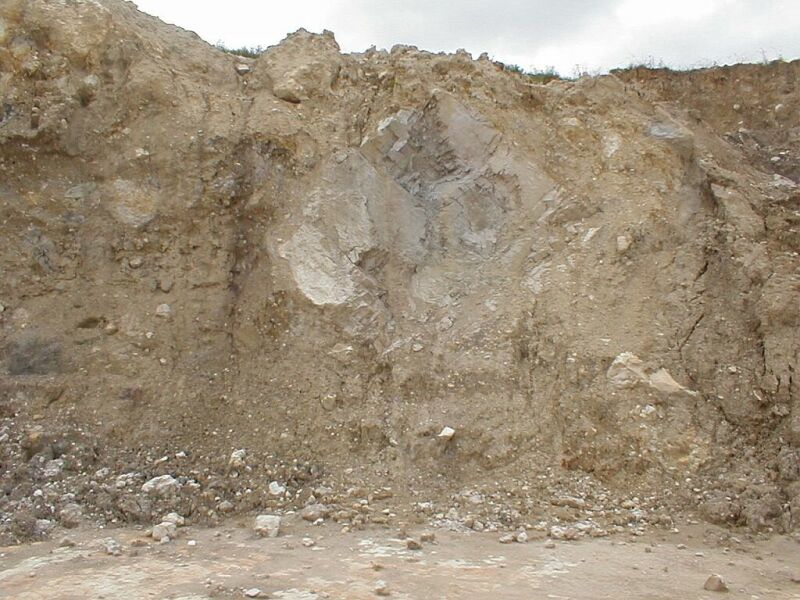 Impact ejecta is a special group of sediments comprising material that is thrown out from an impact crater in the excavation stage and deposited around it. Impact ejecta are in general extremely heterogeneous due to the target conditions (e.g., continental, marine), target lithostratigraphy (crystalline, sedimentary, mixed target), the complex excavation processes (including, e.g., the hypothesized superficial spall plate ejection, the hypothesized jet to form tektites), and the complex ejecta landing and emplacement processes. The latter include secondary cratering and mixing with local material, and computer modeling suggests that in very large craters excavated ejecta may even mix with collapse material in the modification stage of impact cratering. Globally, impact ejecta are subdivided into proximal and distal ejecta, and it is easily understandable that the size of the ejected clasts on the whole decreases with increasing distance of deposition. Whereas the size of proximal ejecta clasts may reach to the order of kilometer, microscopic distal ejecta may in very large impacts extend worldwide (e.g., in the K/T boundary Chicxulub impact). 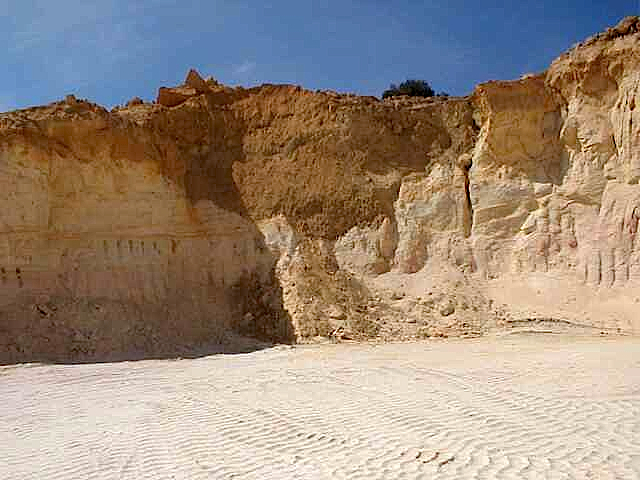 Although the thickness of proximal impact ejecta (by definition, exposed < 5 crater radii from the point of impact) may be considerable (several hundred meters, e.g., at the Mid-Tertiary Azuara impact structure, Spain – the Pelarda Formation), impact ejecta in contrast to the Moon and other planets are rare on Earth primarily as the result of rapid erosion. In many cases, proximal impact ejecta can sedimentologically well be described as diamictites and breccias including megabreccias (e.g. the Alamo and the Azuara megabreccias) and multiple breccia generations (breccias-within-breccias). 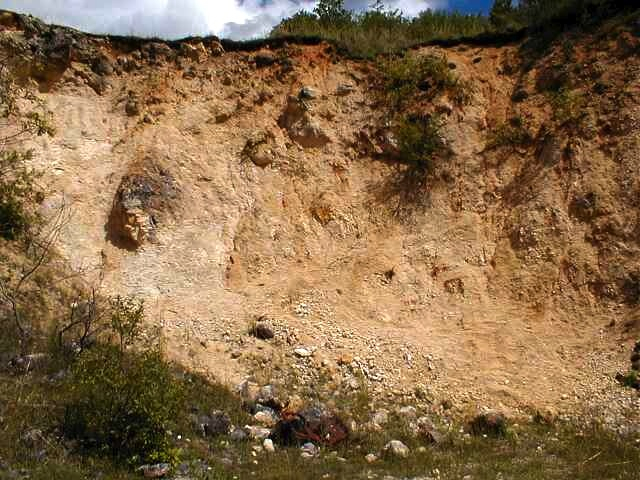 The diamictic character of many impact ejecta has established the hypothesis (e.g., Rampino M.R. : Tillites, diamictites, and ballistic ejecta of large impacts. – J. Geology, 120, 439-456, 1994) that glacigene tillite deposits may in fact have originated from large impacts (the ice age paradox). This hypothesis is thus far not supported by compelling evidence. Impact ejecta may clearly be identified by impact melt rocks, glass, suevite breccias, characteristic high-pressure/short-term deformations and the occurrence of shock metamorphism and macroscopic shock effects like shatter cones. 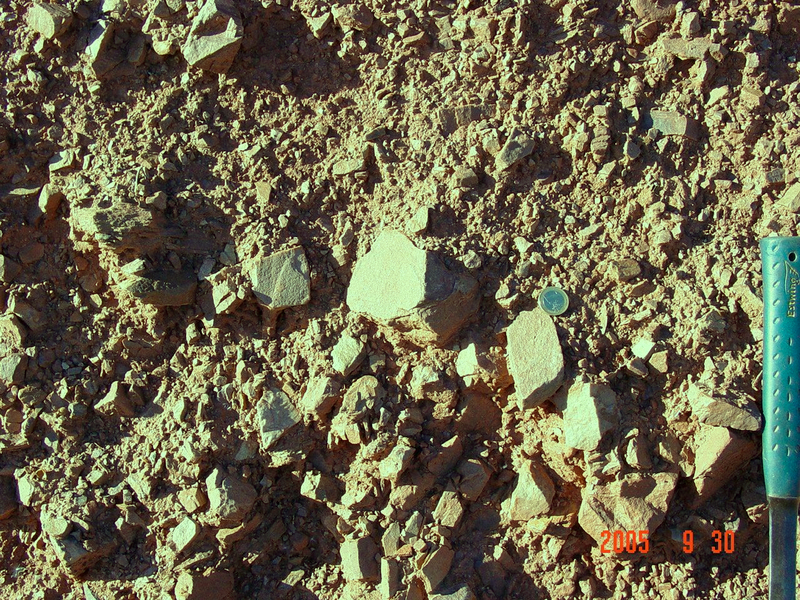 Distal ejecta may show spherulitic texture. 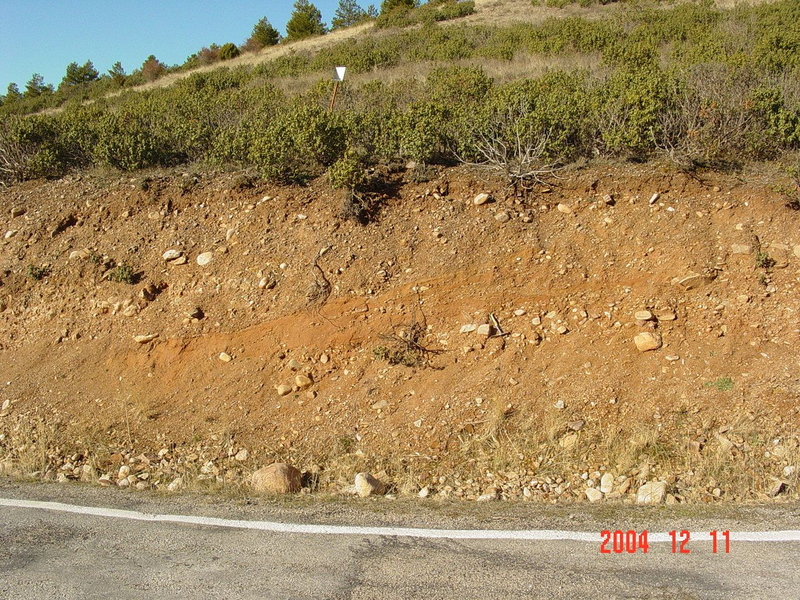 In old ejecta deposits, the impact signature may largely be overprinted by weathering and various metamorphic processes. In the Ries crater Bunte Breccia ejecta, components that were stratigraphically separated by hundreds of meters in the target can now be observed in close contact. This is due to the ejection trajectories in the complex excavation flow field. Fig. 1. Gundelsheim quarry (about 20 km away from the crater center). 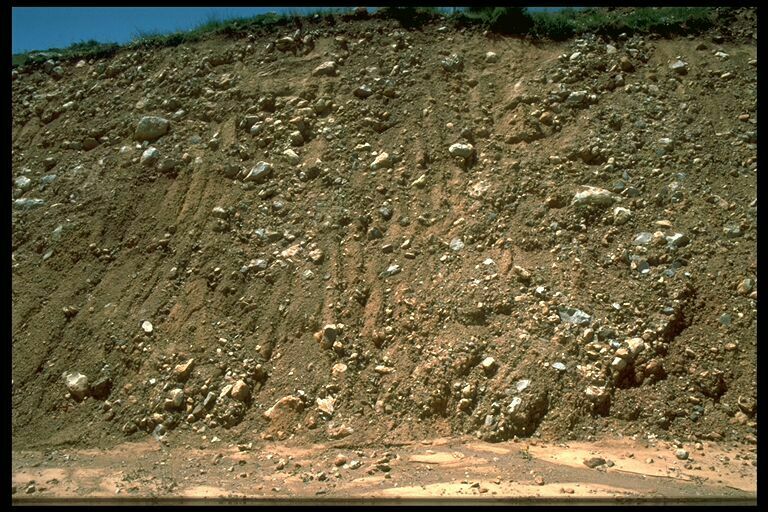 The multicolored breccia (Bunte breccia) ejecta as waste material in the limestone quarry must continuously be removed. Fig. 2. Another aspect of the Ries crater impact ejecta on top of the autochthonous Malmian limestones in the Gundelsheim quarry (about 20 km away from the crater center). Fig. 3. 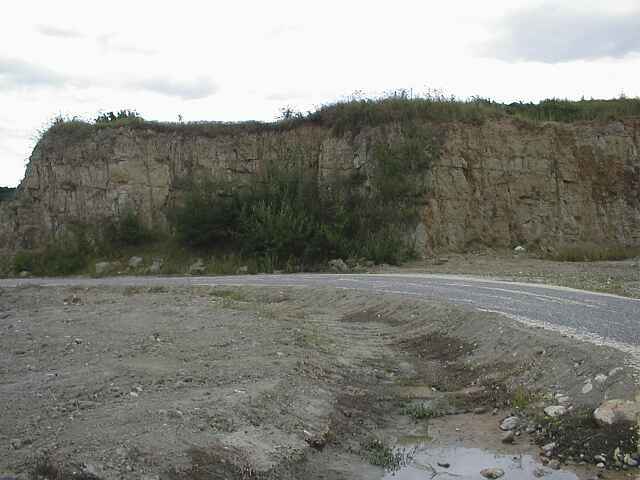 Ronheim limestone quarry (about 14 km away from the crater center). Like in the Gundelsheim quarry the multicolored breccia (Bunte breccia) ejecta as waste material on top of the limestones must continuously be removed. Fig. 4. 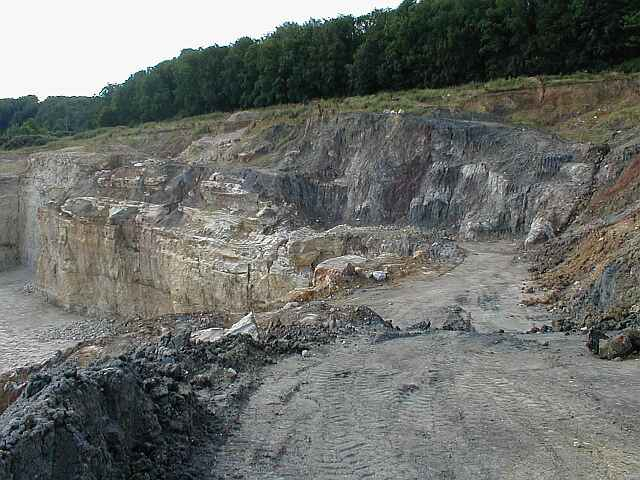 Another view of the Ronheim limestone quarry (about 14 km away from the crater center). The term “Bunte (=multicolored) breccia” for these ejecta deposits is fully justified. 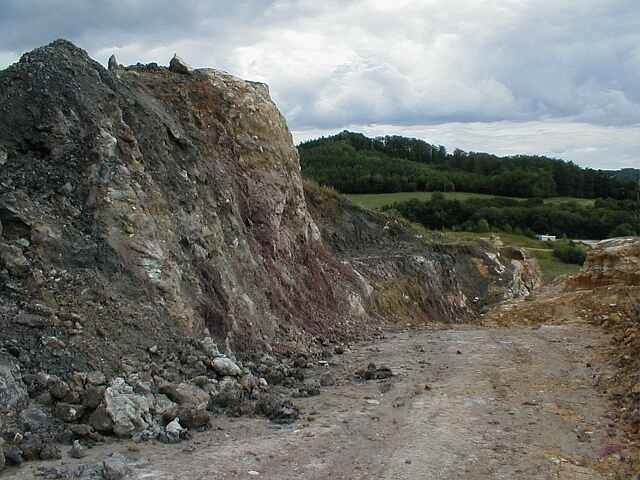 In the Aumühle quarry roughly 12 km from the crater center the Bunte breccia ejecta are exposed in contact with a prominent suevite layer (grayish) which is exploited as aggregate for the cement industry. All around the Ries crater the crystalline-dominated suevite is more or less always deposited on top of the sediment-dominated Bunte breccia reflecting the excavation stage of impact cratering (more can be read HERE). the author Richard A. Zimmerman, rehashing the old story, postulated a diatremic formation of the Ries crater with regard to exactly this depositional sequence. In the Otting Bunte breccia-suevite quarry (equivalent to the Aumühle outcrop) he observed a time lapse with some reworking between the two units (of course!) and concluded a repetitive action compatible with volcanism but incompatible with impact. More about this odd aspect of geology can be read HERE. Fig. 5. 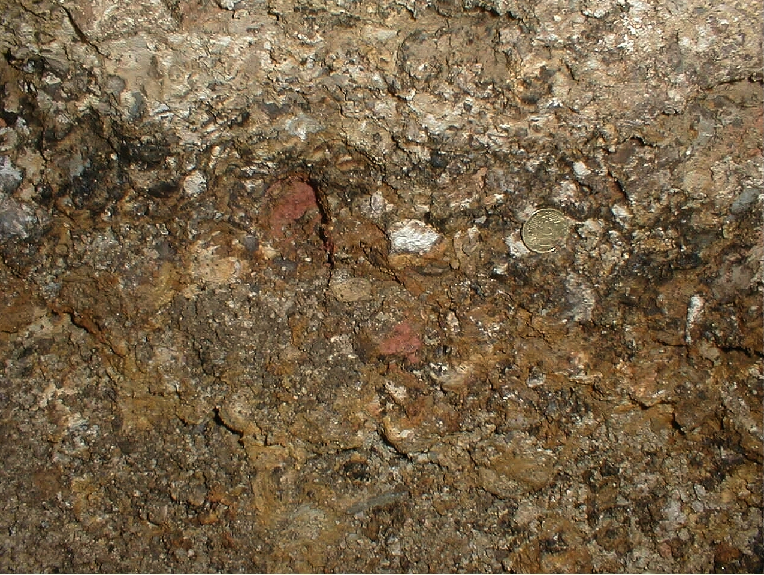 Aspect of the Aumühle quarry in the ejecta zone of the Ries crater exposing the multi-colored breccia (Bunte breccia) and the grayish suevite deposit. Closer views in Figs. 6, 7. Fig. 6. Ries crater ejecta in the Aumühle quarry (roughly 12 km from the crater center) comprising suevite (grayish) and multicolored Triassic and Jurassic sediments. 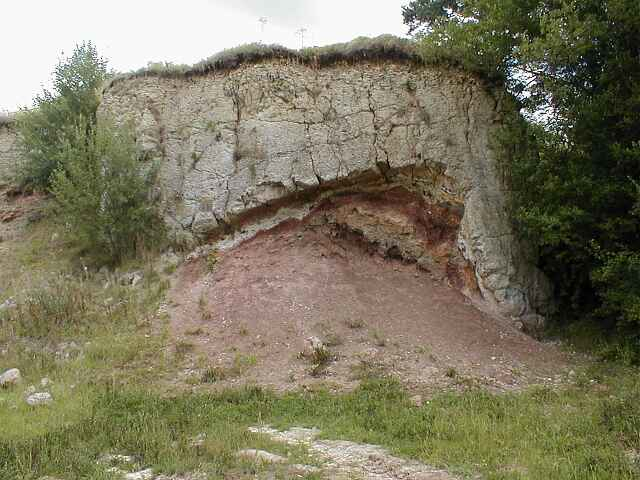 The strongly shocked and glass-rich suevite was deposited after the emplacement of the Mesozoic ejecta. Fig. 7. Ries crater ejecta in the Aumühle quarry. Suevite lying over Bunte breccia (mostly Triassic and Jurassic sediments). Details of this depositional sequence have been interpreted by Richard A. Zimmerman (2003) as to prove a volcanic, diatremic origin for the Ries crater (see above). FIg. 8. 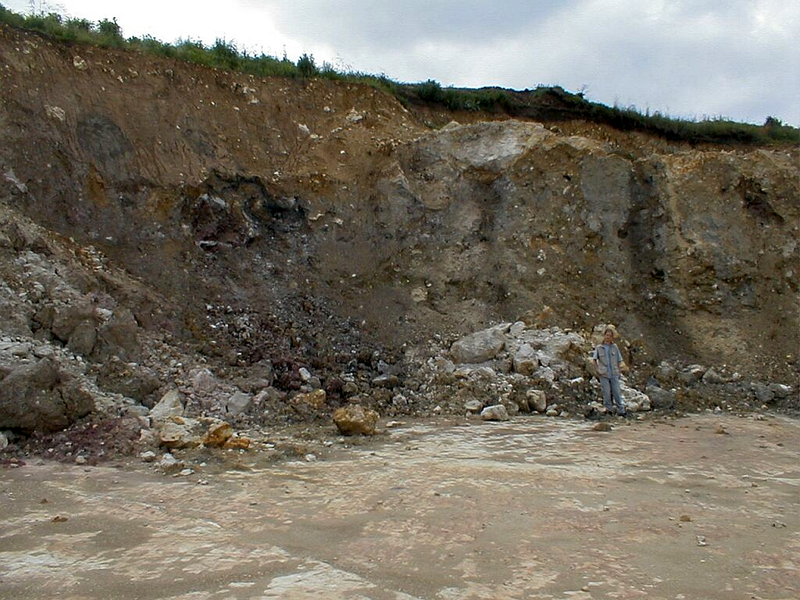 The massive suevite ejecta deposit in the Aumühle quarry. The jointing may be ascribed to cooling fractures which developed after landing of the suevite mass. In larger impact structures big coherent blocks may be excavated and ejected to land far outside the final crater. A classical location is the Ries impact structure (Germany) where innumerable coherent megablocks have been ejected over distances of up to 15 km from the crater rim. 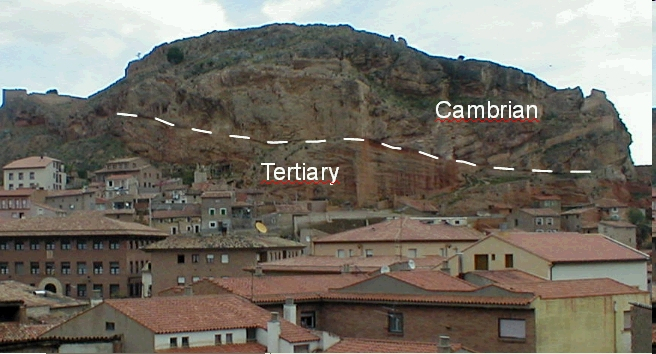 An exceptional but comparable situation is given with the so-called Daroca thrust and the large 40 km-diameter Azuara impact structure in Spain. Here, a many kilometers long Cambrian stratigraphical unit appears to have left the growing impact excavation cavity in toto to land as an allochthonous horizontal thrust plate over Tertiary which has puzzled geologists for decades and has now found an explanation by the Azuara impact event. A comprehensive article addressing both the Ries crater and Azuara megablock ejecta can be clicked HERE. Fig. 9. Ries impact crater: dislocated Malmian megablock as part of the ejecta blanket. 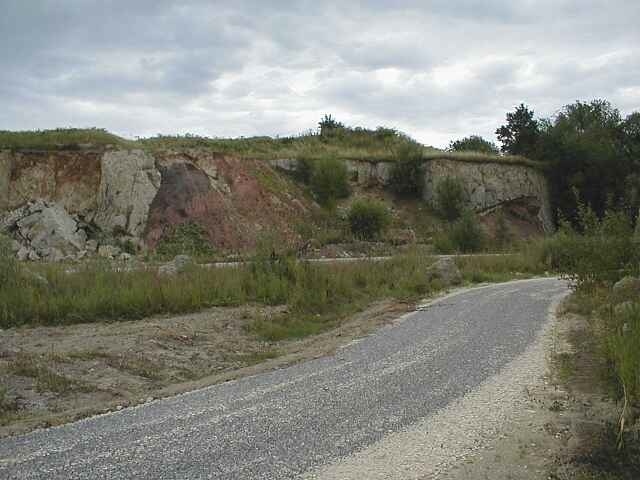 Iggenhausen quarry, about 12 km from the crater rim. Although the limestone is fractured and grit-brecciated through and through, the megablock sized of the order of a few hundred meters has remained coherent despite a transport range of at least 12 km. For early geologists, at the time familiar with the volcanic origin of the Ries crater, these enormous megablock displacements were a worry. More can be read HERE. Fig. 10. Thrust plate of Cambrian Ribota dolomite over diamictic soft Tertiary; Daroca, Province of Zaragoza, Spain. The Cambrian unit is explained as to have originated as part of a giant allochthonous megablock from the Azuara impact structure. Upon meteorite impact at cosmic velocities excavated rock masses are leaving the growing excavation cavity at considerable velocities at the order of a several 100 m/sec. Ballistic transport assumed they are landing at comparable velocities, and because of the oblique trajectory the vector of emplacement energy basically has a very strong horizontal component. Logically, the erosive power of the landing masses can be enormous, and especially Oberbeck (1975) has developd the conceot of ballistic erosion and secondary cratering. Around the Ries crater boreholes drilled deep into the Bunte breccia ejecta layer revealed an enormous contribution of local Tertiary material from the immediate crater environment mixed into the primary ejecta by this process of ballistic erosion (Hörz et al. 1983). 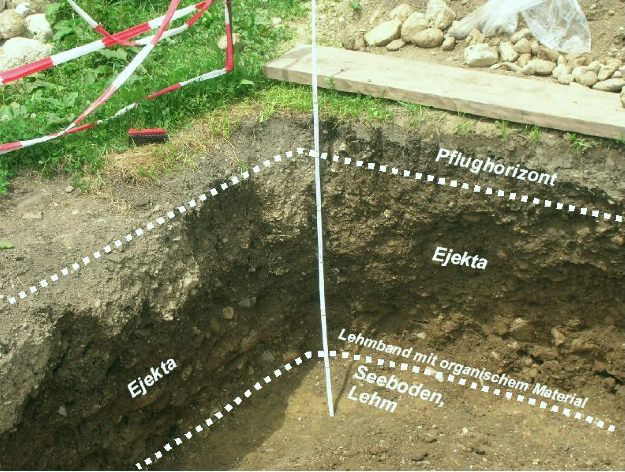 An impression of this geologically educational process is given e.g., in the large Ronheim and Gundelsheim limestone quarries (Figs. 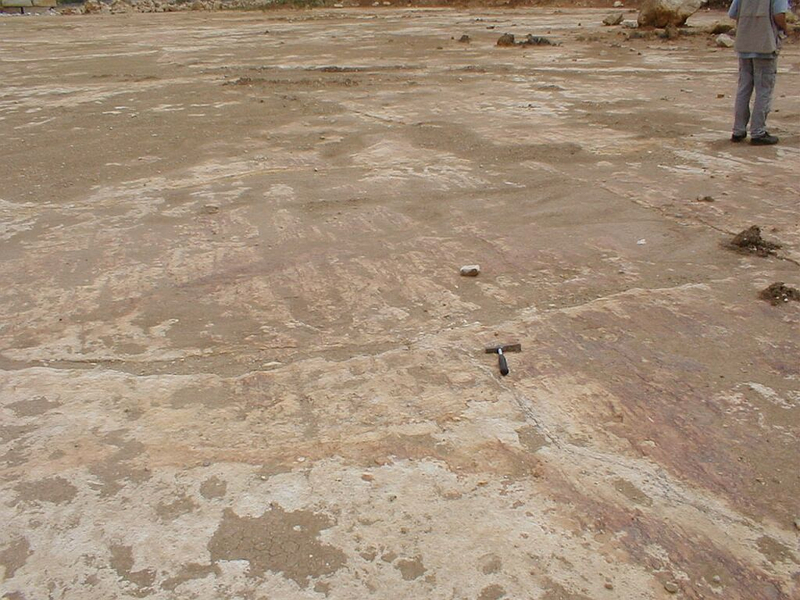 1, 3) where from time to time the erosive power of the Bunte breccia emplacement is exposed and can be observed in the form of prominent striations (Fig. 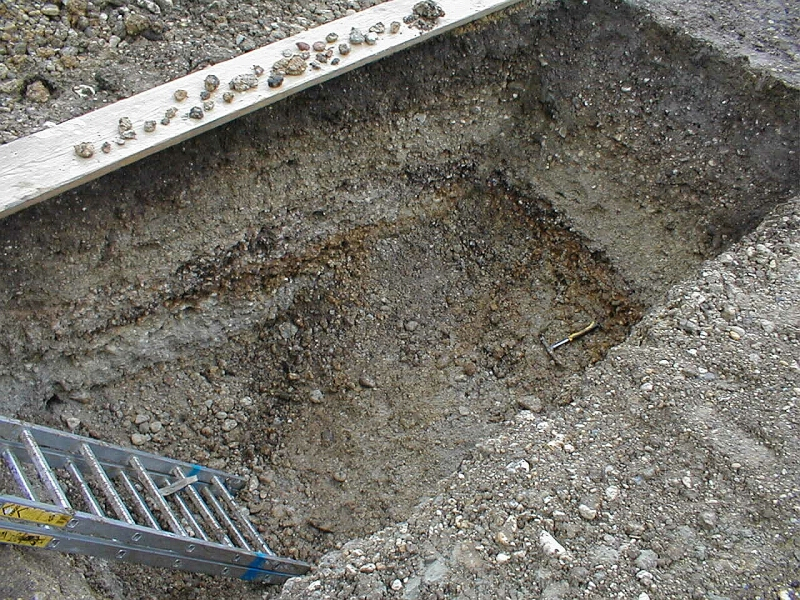 11) in general pointing to the center of the Ries crater. Fig. 11. Distinct striations from highly energetic erosive landing of the Bunte breccia ejecta having removed all overburden of the autochthonous Jurassic limestones. Fig. 12. 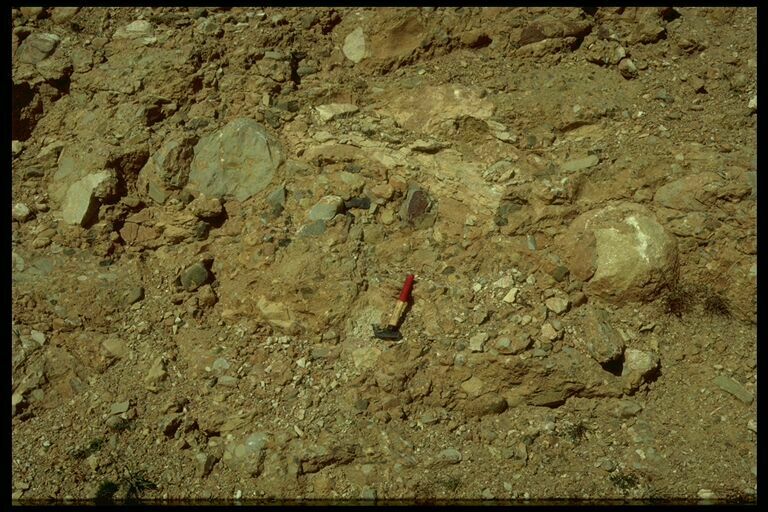 Rubielos de la Cérida (Spain) impact ejecta channeling well-bedded autochthonous Cretaceous sediments near Escucha. 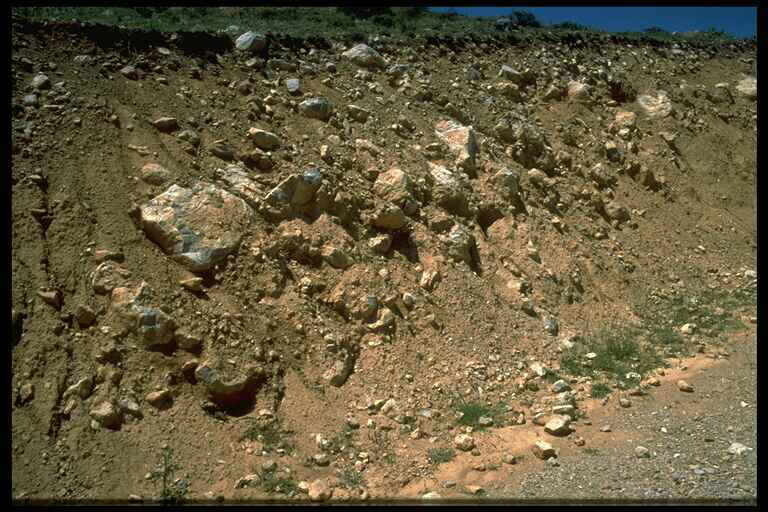 Impact ejecta emplacement (here with a predominant Paleozoic component) can be strongly errosive as shown in the image. Here we are showing a few very characteristic outcrop images, and time and time again we are asking ourselves how regional geologists are interpreting this exceptional setting (earlier considered “enigmatic” by French geologists [Moissenet et al. 1972]) as “quite normal Tertiary conglomerates”. Even the sedimentologist Jan Smit from the university of Amsterdam (not exactly unknown in the impact “community”) insisted on a Tertiary conglomerate (in a written communication from 2000). Fig. 13. 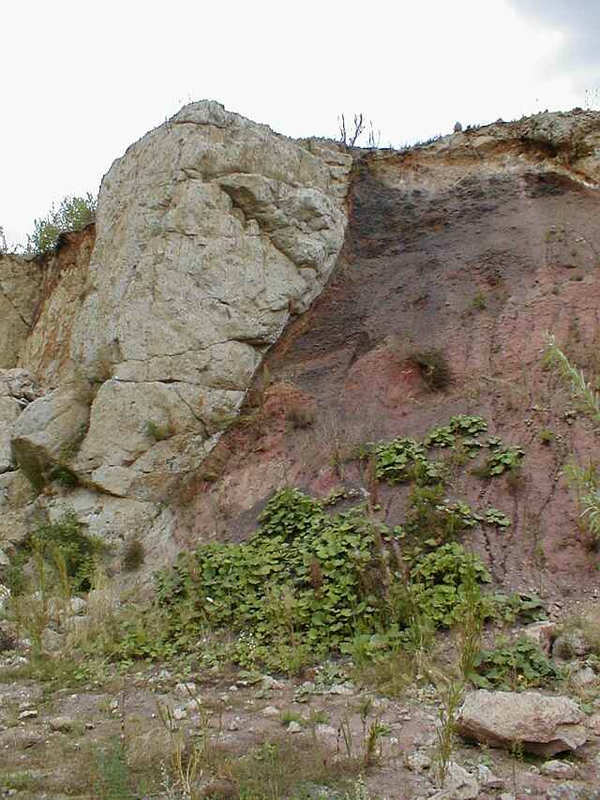 Rubielos de la Cérida (Spain) impact ejecta at the Puerto Mínguez exhibiting a typically diamictic facies. 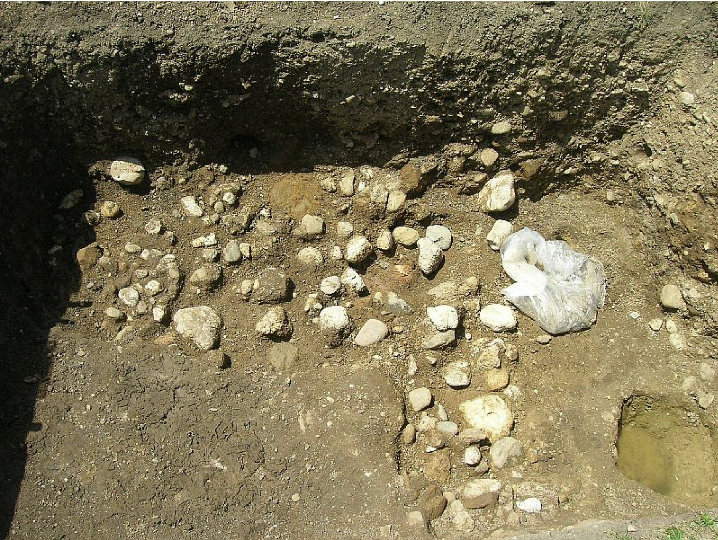 Probably the big limestone blocks before excavation formed a coherent unit in the affected impact target. Different from the mostly Mesozoic clasts the matrix is predominantly Paleozoic. Fig. 14. Puerto Mínguez ejecta, Rubielos de la Cérida impact basin. Like in Fig. 12 we are dealing with a typically diamictic facies – completely impossible to confuse the setting with a conglomerate. Reddish zones are Tertiary material intermixed in the predominantly dark Paleozoic matrix material. Fig. 15. Puerto Mínguez ejecta, Rubielos de la Cérida impact basin. A peculiar setting with a complex mixing of Paleozoic, Jurassic/Cretaceous and Tertiary material. 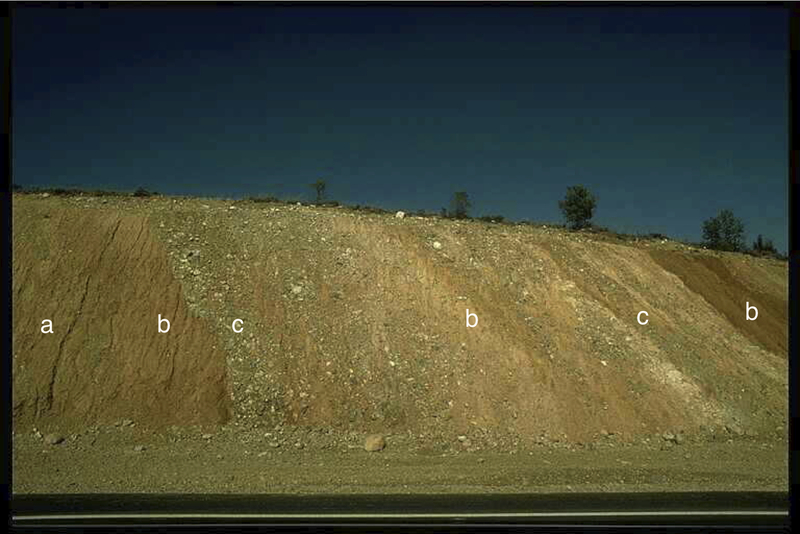 Some rough attribution: a = Mixture of Paleozoic and Tertiary; b = dominating Tertiary; c = Mesozoic carbonate and few Paleozoic silicate clasts in mostly Paleozoic matrix. The angular Paleozoic quartzite fragments may have made Moissenet et al. to write in their 1972 paper about the “enigmatic” deposit at the Puerto (which means pass height) Mínguez. Paleozoic rocks are not exposed up to a distance of about 15 km! At that time impact was not in the focus of geologists. Fig. 16. Closer view of the diamictic facies of the Puerto Mínguez impact ejecta. Without exception the Mesozoic carbonate clasts are heavily deformed plastically which is in great detail described in the above-mentioned articles. 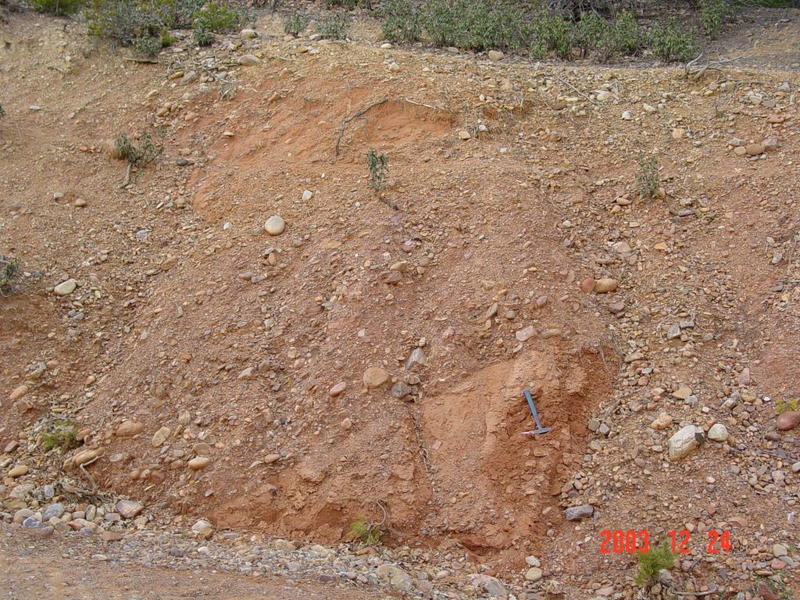 The Spanish impact ejecta shown here in typical exposures demonstrate that many geologists are simply helpless when confronted with these sediments. This applies especially to the impact ejecta deposit of the Pelarda Formation. They have been interpreted as conglomerates and as Quaternary alluvial fans; the strong deformations and shock effects are ascribed to tectonics (even to Quaternary tectonics) or suppressed. Here we show a few images; a more comprehensive article can be clicked HERE . Fig. 17. Pelarda Formation ejecta, Azuara impact structure; road between Fonfría and Olalla. The diamictic character of the ejecta is evident, although small conglomeratic accumulations my be intercalated. This is not surprising since the Azuara impact target was to a large extent composed of conglomerates, and even in the process of ejecta emplacement the contribution of much water to produce depositional flow textures is to be expected. Fig. 18. Another aspect of the Pelarda Formation diamictic impact ejecta. Fig. 19. Closer view of the Pelarda Fm. impact ejecta exhibiting all but a conglomeratic facies. Quartzite clasts (Armorican and Bámbola quartzite) have been analyzed for shock effects, and there are a lot, e.g., in the form of planar deformation features (PDFs). Fig. 20. Ejecta layer of the Tüttensee crater in the town of Grabenstätt; Chiemgau impact. Fig. 21. The layer of the Tüttensee impact ejecta in Grabenstätt; Chiemgau impact. Preserved rounded and strongly shattered Alpine cobbles contribute to the diamictite. Abundant shock effects are documented in thin sections of the clasts. Fig. 22. The Tüttensee impact ejecta layer at the Mühlbach location, Chiemgau impact. The stratigraphical sequence is autochthonous loam from an ancient lake bottom below the ejecta layer and the uppermost soil. Fig. 23. The base of the Tüttensee crater ejecta. The cobbles and boulders were ejected and are still sticking in their original position in the loamy autochthonous substrate. Many of the clasts are fractured nevertheless however remained coherent thus proving a fracturing upon the highly energetic emplacement of the landing ejecta. The Impact ejecta page is so far provisional and will be considerably enlarged.